Ever had trouble getting out of a tight parking spot? Imagine how convenient it would be to have a camera in your car to help you out. Stop panicking every time you find yourself in a tight spot and purchase the 9" split screen monitor with built-in DVR. This lightweight, thin LCD monitor has four video inputs, allowing you to connect up to four different cameras at once or a game system or DVD player. Enjoy the advantage of having assistance backing up and being able to connect gaming and video devices to keep your kids entertained on long car trips. 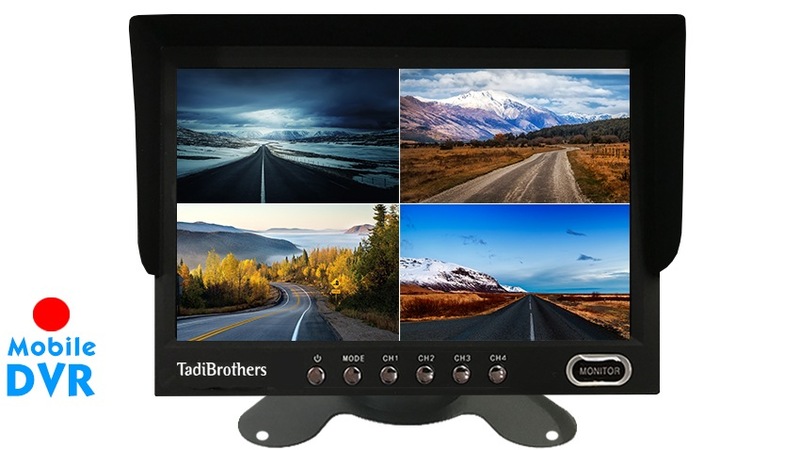 Not only does our 9" split screen monitor with built-in DVR make it safer and easier to back out of parking spots, it also supports up to 32GB of content or 20 hours of recording, which is very convenient in the event of an accident. • 9” split screen monitor with built-in DVR has the ability to connect up to four cameras, a game system or a DVD player. • Connects to any power source or a cigarette lighter. • Light and thin LCD monitor is super easy to install. • Built in SD slot allows you to record everything on your screen with a timestamp. • Record for nearly 20 hours or 32GB of video. • 15-foot cable is included, with the option to upgrade to a premium extension cable. • Complimentary window and dash mount included with purchase.